German mathematician, born at Potsdam, of Jewish parentage, on the 10th of December 1804. 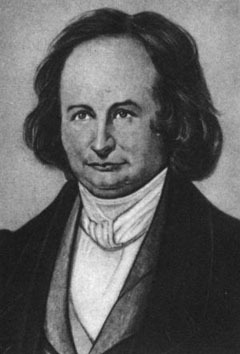 He studied at Berlin University, where he obtained the degree of doctor of philosophy in 1825, his thesis being an analytical discussion of the theory of fractions. In 1827 he became extraordinary and in 1829 ordinary professor of mathematics at Königsberg, and this chair he filled till 1842, when he visited Italy for a few months to recruit his health. On his return he removed to Berlin, where he lived as a royal pensioner until his death, which occurred on the 18th of February 1851. His investigations in elliptic functions, the theory of which he established upon quite a new basis, and more particularly his development of the theta-function, as given in his great treatise Fundamenta nova theoriae functionum ellipticarum (Königsberg, 1829), and in later papers in Crelle's Journal, constitute his grandest analytical discoveries. Second in importance only to these are his researches in differential equations, notably the theory of the last multiplier, which is fully treated in his Vorlesungen über Dynamik, edited by R. F. A. Clebsch (Berlin, 1866). It was in analytical development that Jacobi's peculiar power mainly lay, and he made many important contributions of this kind to other departments of mathematics, as a glance at the long list of papers that were published by him in Crelle's Journal and elsewhere from 1826 onwards will sufficiently indicate. He was one of the early founders of the theory of determinants; in particular, he invented the functional determinant formed of the n^2 differential coefficients of n given functions of n independent variables, which now bears his name (Jacobian), and which has played an important part in many analytical investigations. Valuable also are his papers on Abelian transcendents, and his investigations in the theory of numbers, in which latter department he mainly supplements the labors of Carl Friedrich Gauss. The planetary theory and other particular dynamical problems likewise occupied his attention from time to time. He left a vast store of manuscript, portions of which have been published at intervals in Crelle's Journal. His other works include Commentatio de transformatione integralis duplicis indefiniti in formam simpliciorem (1832), Canon arithmeticus (1839), and Opuscula mathematica (1846-57). His Gesammelte Werke (1881-91) were published by the Berlin Academy.